Bowen Island’s village centre and ferry dock happen to be in the same place, Snug Cove. When you add cars into the mix, for about five minutes every hour, it can feel like you’re in downtown Vancouver, not on a quiet island. With a large summer population and more amenities popping up in Snug Cove (and limited parking), where you’re supposed to go and how you’re supposed get there can be as clear as mud. The Bowen Island Municipality has put together a couple of handy guides to help newcomers and old-timers alike: the Ferry Guide, a recent parking flyer, and the Transportation Guide are featured here. 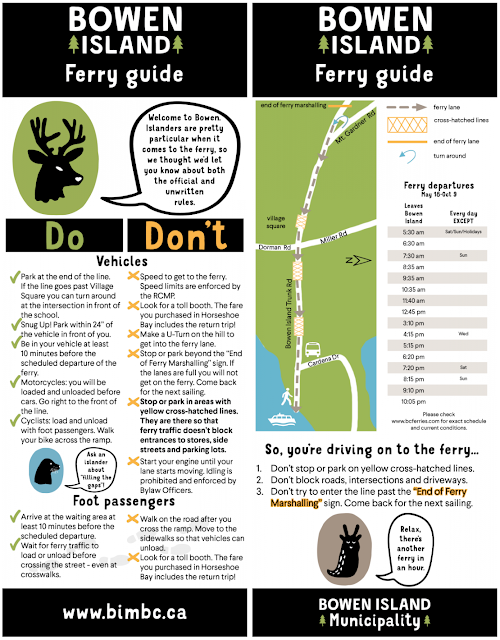 Here's the Ferry Guide: (Click here to see larger PDFs). This is a great little flyer to remind ferry users about line-up etiquette. 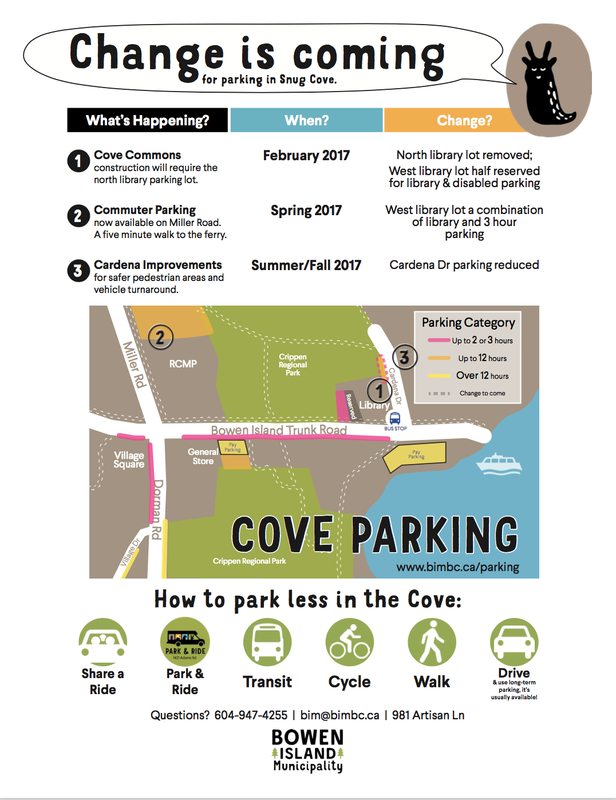 Here's the Parking flyer: (Click here to see a larger PDF). This is very handy for visitors too, as often being able to plan ahead where you will park while you shop will take the stress out of heading to the Cove, especially if you happen to arrive during "rush minute" (ferry loading time), or if you're parking for more than two hours. 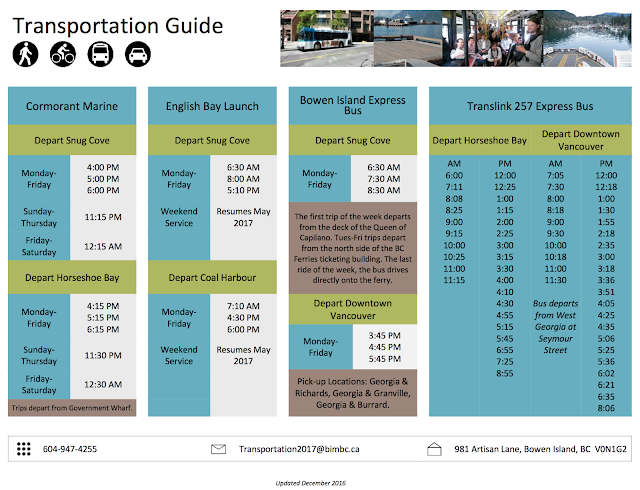 And here's the Transportation Guide (Click here to view a larger PDF). 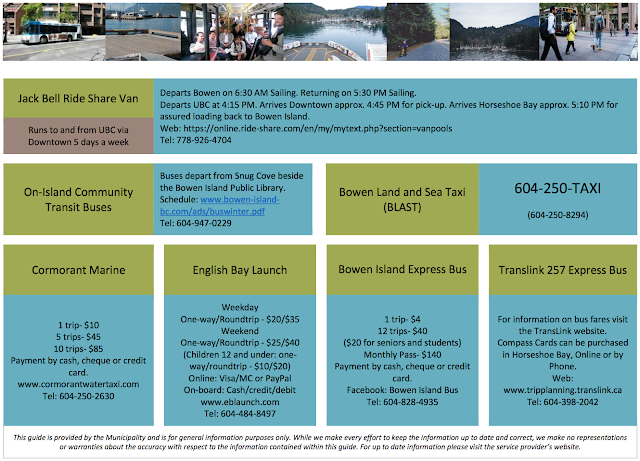 Other great options for getting to and around Bowen Island are listed here. Why not take the bus? A taxi? A water taxi? Or two wheels... check out Zoom Zoom Bowen for scooter rentals.